Why it is necessary to replace a lost tooth ASAP? One tends to realise the need for tooth replacement only if the lost tooth was visible, or if the number of remaining teeth is much lower than that of the lost ones. Actually, the lack of a single molar can cause serious problems. The neighbouring teeth become crooked, which increases the chance of cavities. Meanwhile, the tooth opposite to the lost one starts to overgrow, then loosens and falls out. Chewing difficulties lead to digestion problems; a speech impediment may occasionally arise. If you lose a tooth, strive to get at least a temporary replacement so that your remaining teeth remain healthy. There are several tooth replacement methods available, so you will certainly find a solution meeting your needs. A crown is a structure that defends a damaged tooth from further deterioration. Also, it is affixed to an implant (which, in turn, is an artificial tooth root); the crown constitutes the visible part of the tooth. Tooth replacement starts with chiselling the remainder of the damaged tooth. Then an impression of the stump is made, based on which a stable frame is made, which bears strong load. Finally, the frame is covered with an aesthetic crown. If there is too little remaining tooth, a pin is built into the tooth root, and the artificial tooth is affixed to that. 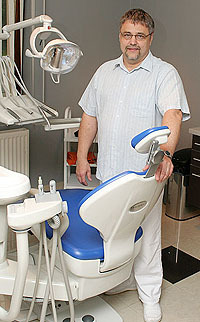 One or more teeth can also be replaced with a so-called bridge. The teeth next to the empty socket(s) are chiselled, an impression is made, and the missing teeth are replaced with a bridge. If the neighbouring teeth (the so-called pillar teeth) are in a poor condition, then this is the perfect solution because not only are the missing teeth replaced, but the neighbouring damaged teeth are also protected and reconstructed. Instead of chiselling the teeth next to the empty socket, a so-called inlay bridge can also be constructed. This allows for the removal of a minimum amount of tooth material. An inlay is inserted into the pillar teeth, to which the bridge itself is attached. However, this method cannot be applied when several teeth are missing. In case of a major lack of teeth when the remaining teeth are not strong enough to support a bridge, an implant is used. The head affixed to the implant plays the role of pillar teeth and keeps the bridge stable. The simplest removable denture is a tooth clip. As the name implies, it can be clipped onto the teeth next to the empty socket. It is a tooth replacement method that should be temporary. A dental clip is not recommended for the replacement of a frontal tooth because it is not very aesthetic. However, it is perfectly suitable for chewing until the final replacement of a missing tooth, and it also prevents the neighbouring teeth from slanting. In case of a grave lack of teeth (when only a few teeth are left in the patient’s jaw), removable dentures should be affixed with a telescopic crown. The primary crown is inserted into the jaw, while a secondary crown is inserted into the denture. These two crowns match each other perfectly, allowing for simply snapping the removable denture into place, where it remains stable. A removable full denture made of hard acrylate is best used to replace teeth in the upper jaw. A plate stuck to the mucous membrane on the palate stabilises the artificial gums and teeth. The denture does not have to be removed for the night (but only for cleaning). Denture adhesive is recommended for an increased feeling of comfort. If there are natural teeth or fixed artificial teeth in the jaw, then partial tooth replacement with a plate is possible. The new denture is attached to the natural or artificial teeth with precision attachments (Ot-cap, Preci). 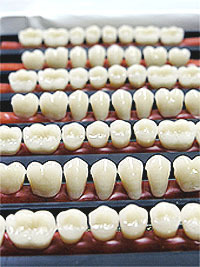 Metal-ceramic artificial teeth are widely used and relatively low-cost items that take little time to make. Even though the ceramic material of the crown can be coloured arbitrarily, the underlying metal structure of the tooth prevents light propagation, so the opacity of natural teeth cannot be achieved. From the perspective of functionality and aesthetics, the best solution involves the usage of non-metallic zirconium-oxide tooth frames. 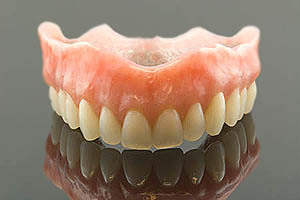 Such dentures are long-lasting and they suit the remaining (natural) teeth perfectly. In addition to conventional tooth replacement methods, an artificial tooth root (an implant) can also be inserted into the patient’s jaw. Implants are made of non-allergenic unalloyed titanium, and when they are inserted, there is no need to chisel the neighbouring teeth. Implants can also be used to affix removable dentures, which makes those dentures much more convenient to wear.